The pitched roofs common to regions that experience inclement weather are ideal because the design ensures that water, snow, debris, and other elements run off the roof instead of collecting and increasing risks like rot, leaks, collapse, or other damage. When paired with proper gutters and downspouts, risks are reduced even further, providing private residences and commercial properties alike with the greatest possible protection from the elements. Even with these precautions in place, however, a long winter fraught with heavy storm activity can result in dangerous snow and ice buildup on roofs. If the ice gets too heavy or it starts to melt, the result could be an avalanche of snow and ice sliding off the roof, and this could damage the roof, the gutters, and anything below. It could also be a major liability if people happen to be in the path of destruction. Snow shoes, snow guards and snow rails are designed to prevent this occurrence, and there are several reasons why you might want to hire the professionals at Top Notch Seamless Gutters to install these preventive measures. There are many different snow shoes and snow guards to choose from, but you can generally expect a product with a flat side that attaches to the roof, topped by a vertical slat that is a couple of inches in height. These will be attached to the surface of your roof roof on a grid specifically designed to disrupt snow and ice in order to prevent dangerous slides. With snow shoes/snow guards in place, snow and ice can only fall off the roof in small amounts, or even melt completely before running into gutters, significantly reducing the potential for a dangerous avalanche situation. This is why snow shoes/snow guards are ideal for both private residences and commercial properties. You may naturally be concerned about the appearance of these products on your roof, but most are designed to be inconspicuous. Some are clear and matte in appearance so that they pick up the look of the roof underneath and remain virtually invisible in sunlight. Some are colored and some can be painted to match your roof. They also come in a variety of materials to match different roof types. In other words, you can not only increase safety and protect your roofing, gutter installation, and anything below the roofline, but you can also maintain the aesthetics of your property. A snow rail is an alternative to snow shoes/snow guards that virtually accomplishes the same task, but features a single or double rail that runs along the lower entire edge of the roof, above the gutters. If you’re concerned that snow shoes/snow guards aren’t enough to prevent avalanches, a snow rail offers added protection. Or you might prefer the look of one product or another. Either way, snow rails simply offer another option to consider when it comes to protecting your property and reducing liability. 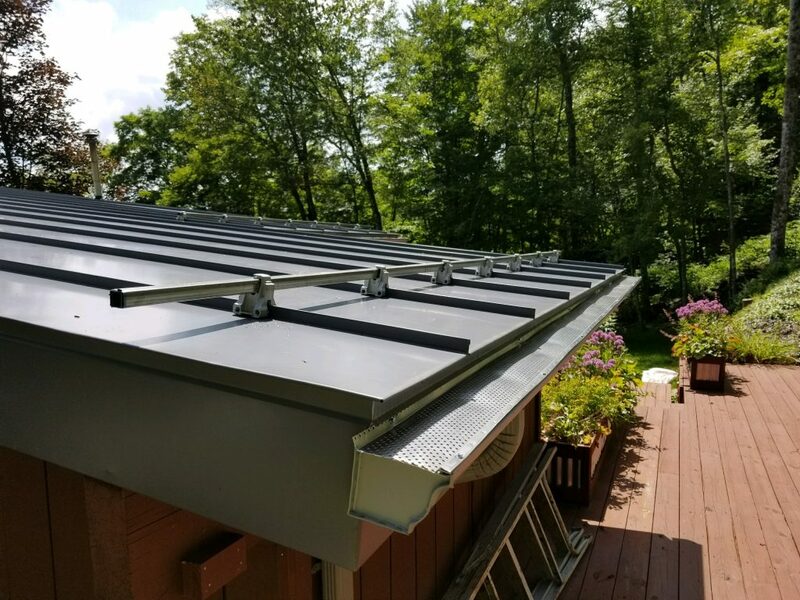 Top Notch Seamless Gutters is pleased to offer both types of products for your convenience, so don’t hesitate to contact us to schedule your free consultation and estimate for installation today.